The ball spat off the middle of his bat to all corners, turning into parabolas that the crowd was hollering for. 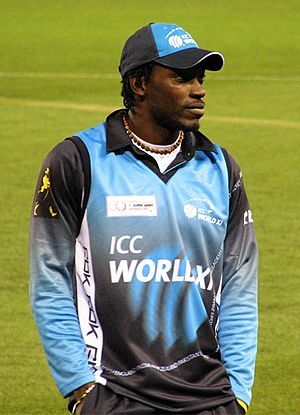 Gayle faced more than half the balls bowled by the Warriors and produced a compressed 20-over highlights package. Sharda Ugra, CricInfo on a Gayle IPL innings. An innings-by-innings breakdown of Gayle's Test match batting career, showing runs scored (red bars) and the average of the last ten innings (blue line). Chris Gayle Facts for Kids. Kiddle Encyclopedia.